Sir Walter Scott (1771-1832) was the author of immensely popular historical novels and poetry. Their combination of history, heroism, chivalry and romance was especially beloved by readers of the Victorian era. ‘The Lady of the Lake’ (1810) was the third of his epic narrative poems inspired by the landscape and legends of the Scottish Borders. 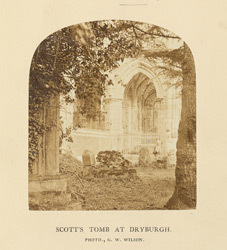 The title page of this 1863 edition of the poem is illustrated with a photograph by Goerge Washington Wilson of Scott’s tomb at Dryburgh Abbey, a ruined monastery founded in the 12th century near Melrose in Scotland. He chose to be buried here for his ancestral associations with the abbey and for the beauty and seclusion of its woodland setting beside the River Tweed. His tomb is situated in St. Mary's Aisle in the north transept, and his wife and eldest son are also interred here.